Hip, Hip, Hooray! It’s our latest branding identity board that we did for our client, Life Over Ice! When Nikki, the founder of Adult Beverage Company, came to us with this fantastic concept of creating a blog where she can share her off-the wall stories and great business tips we jumped at the opportunity to work with her. Not only is Nikki super fun, but her ideas were right up our alley, bright, fun and savvy! Plus, she wanted us to create her an avatar character that works beautifully with the rest of the branding, and you know we love avatars! Life Over Ice branding choice of colors, typeface and character communicates that the company and products are hip, fun and full of life! 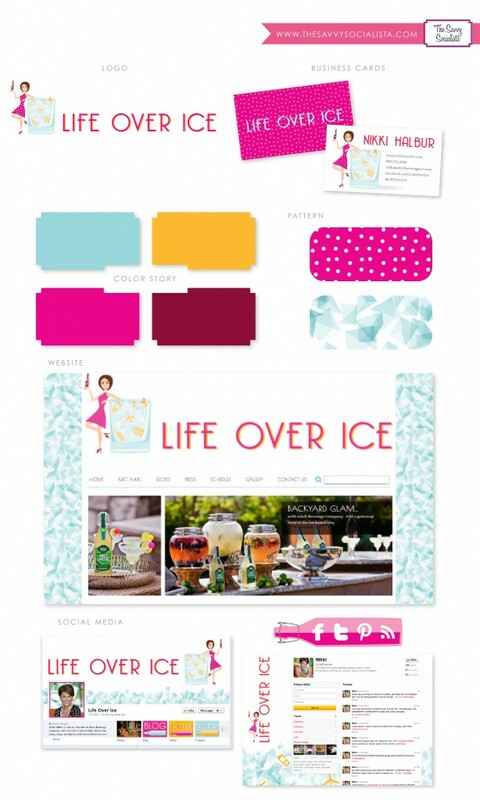 A WordPress blog for Life Over Ice was the perfect platform because not only does it showcase the yummy adult drink concoctions, it also is very simple to learn how to manage the backend, which was key for Nikki, who is one busy gal. The Life Over Ice WordPress blog does a great job in content marketing by providing helpful recipes and using this communication vehicle to share different ways you can use the products. It also publicize the positive press they are getting, like when celebrities are pictured sipping their beverages. For more information on content marketing, check out this article. For ideas on how to get more readers coming to your blog, here is another article to check out. I know, creating a WordPress blog might sound overwhelming at first, but we are here to help you with all aspects of your branding from logo development to writing blog posts and SEO assistance and full web development! Just give us a call anytime. Just have to comment here– The Savvy Socialista is a fantastic partner to have on your team. From the beginning, they “caught” my vision of what I was looking for and they nailed it. They helped me to create a site and a brand that I am so proud of. And, they spent the time training me so I can manage the site on my own. I can’t say enough about the entire Savvy Socialista team. I highly recommend them to any business! Thanks Nikki–we really appreciae your kind words! You’re so welcome! Good luck and let me know if there is anything I can help you with!